Lately I’ve been going round & round on my next-car decision-making process, but I’m starting to come back to earth and remember the main priority here is to not just have a fun car but also save money. 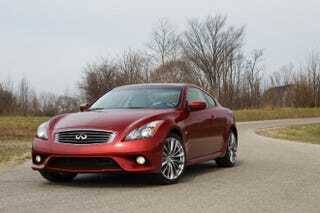 So I’m gravitating back toward my Infiniti G37xS coupe idea. I have a 2013 BMW 135is. The lease ends on June 29. I also have a 2005 Jeep Grand Cherokee Limited Hemi. I need to get down to 1 vehicle instead of 2. Last night I cleaned up the the Jeep and took good pics for posting it for sale. Just need to actually post it. My gf has a 2013 Honda Civic LX that the lease ends July 17. We are working on getting her a new 2016 Subaru Impreza 2.0i Sport Limited to lease. Her lease payoff and likely trade value are pretty much even so she can get out of the Civic with no penalty. We have a 1-car garage, and juggling 3 cars the past couple winters has been a pain, plus right now I’m spending waaaayyyy more per month on my 2 cars than her Civic. The Impreza will be a bit more expensive, but if I replace both of my cars with one awd fun car that costs about $25k (the purchase price at the end of my 135is lease is $30,700) we’ll still save a good $250/month. The car I keep coming back to is the G37xS coupe. With the exception of ventilated seats, it has every single thing on my list, right down to the thigh bolsters, and they can be had for about $25k. But I’m totally open to other ideas, so really, what am I missing?